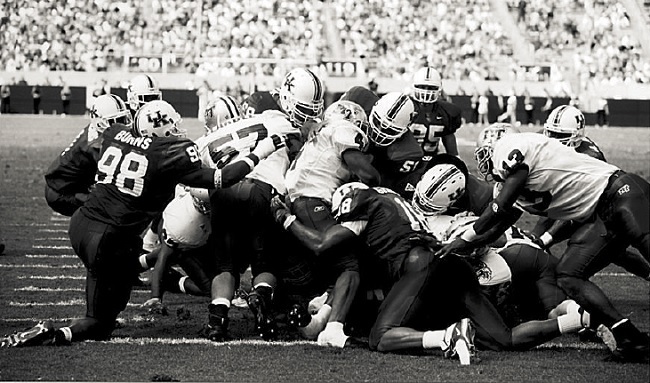 Ahmad (#51, middle) played linebacker at the University of Kentucky. One way or another, Kamaal Ahmad was going to make his mark in this world through sports. Just like a Kennedy getting into a politics, or a Kardashian gravitating toward reality TV, a career in sports for Ahmad seemed like a plan that had been laid out for him since birth — if not before that. With his size, smarts and skill set, Ahmad could’ve been a heavyweight boxing contender. Or he could’ve been the head coach of a big-time college football program in his native Oklahoma. Or maybe the lead recruiter helping build an NCAA basketball powerhouse in his adopted home state of Kentucky. And someday down the road, he might still accomplish one of those feats. Today, however, Ahmad finds himself doing something he admits he “never in a million years” would’ve thought possible: Splitting his time between coaching high school athletes and running youth sports programs at his mosque near Salt Lake City, Utah. Ahmad can credit that to a bold decision he made almost three years ago, when he stepped away from one promising career to further his education about Islam and dedicate himself to studying the Quran. Kamaal was born into a family of athletes, one of four children to Wazir and Anita Ahmad. Wazir was a local high school basketball star in Edmond, Okla. One of Kamaal’s uncles and a cousin both played basketball at the University of Oklahoma. Kamaal was a standout in four sports at Santa Fe High School — basketball, football, track and wrestling — before deciding to focus on football and eventually earning a scholarship to the University of Kentucky, where he played linebacker. Playing just one NCAA Division-1 sport wasn’t satisfying his thirst for competition, however, and so Ahmad also joined the boxing team at UK. As a heavyweight — measuring 6-foot-2 and about 240 pounds in his prime — he was an NCAA regional champion and won the Kentucky state Golden Gloves tournament. After college, Ahmad continued to box — advancing into the regional rounds of the 2008 USA Olympic trials — at the same time he got into coaching. He spent six years on the football staff at Weber State University in Ogden, Utah, under the tutelage of veteran head coach Ron McBride. Ahmad wore several hats at Weber State, from assistant coach in charge of various position groups to recruiting coordinator to NFL liaison to director of football operations. 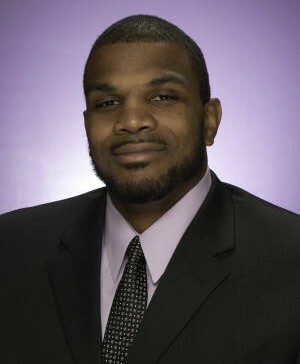 He was a rising star in the college coaching ranks. The next logical step for Ahmad would be to get hired as an assistant coach at a bigger college, or maybe even a head coach at a smaller school. But when McBride retired after the 2011 season and left his staff of assistants in limbo, Ahmad took a path less traveled. Taking up an offer from Muhammed Shoayb, an imam he’d met in Utah, Ahmad decided to take a year off from the grind of college sports and study the Quran. Almost three years later, Ahmad is currently working as the director of mosque affairs for the Islamic Society of Greater Salt Lake, where many of his clients are kids and teens from the area’s diverse refugee and immigrant community. He is also a special-education teacher and an assistant football and basketball coach at Granger High School. No, Kamaal Ahmad isn’t roaming a Big 12 stadium sideline or traversing the SEC recruiting trail. He’s not throwing jabs and hooks on Friday Night Fights or Boxing After Dark. But he is undeniably leaving his mark, through sports, to a group of young people for whom a positive Muslim male role model is worth more than any championship rings or title belts. UMMAH SPORTS: How are you putting your coaching skills to use these days? KAMAAL AHMAD: I’m more into working with the youth. That’s my focus right now. Salt Lake City has a big refugee community — a lot of people from Africa, the Middle East, Eastern Europe and Latin America — who don’t know American culture. So a lot of times, sports in general is new for them. They might know about soccer or cricket, but basketball and football are new things for them. From a talent perspective, though, I’ve noticed that some of these kids are just as talented as your best athletes from America. It’s just a matter of developing that talent and getting them to play to the best of their potential. My goal right now is to get them at a young age, run them through a crash course and go from there. I’m doing that through the youth program at the Islamic Society of Greater Salt Lake. My official title is Mosque Affairs, but I run the youth program and all of the sports programming. With the kids you work with at the mosque, do you notice a difference in their attitudes toward sports and competition compared to a kid who is raised in America? With the parents, yes. With the kids, no. Some parents don’t understand the benefits of playing sports. They just see it as a game. They don’t understand that keeping kids active is a good way to keep them out of trouble. And just from a physical standpoint, you’re getting in shape, you’re learning how to deal with others, you’re learning teamwork, you’re learning a new skill that can take you a long way. Sports can pay for your college education. What are some important lessons you’re trying to get across to the kids? Follow instructions. Never let anyone outwork you. And remember your principles that you’ve learned through the religion. You can play with passion, but you have to carry yourself a certain way. Remember who you are and what you represent. What is your role at Granger High School? I’m going into my second year teaching and coaching at the high school. This year I’m not going to coach football, because I wanted to really focus on Ramadan and that took me away from the summer practices. I might coach basketball and track, but I’m still debating. I’ll probably go back to coaching football next year. Are you still involved in boxing? I’m going to get back into it. I haven’t fought competitively since 2008 at the U.S. regionals. That’s one of my goals — to get in shape and get back in the ring. I want to compete in the Golden Gloves again, hopefully in the national tournament. Do you see yourself a football guy who’s also into boxing? Or a boxer who’s into football? I’m actually a basketball guy. I come from a basketball family. That’s what I thought I’d be playing in college. When you grow up in Oklahoma, you’re gonna play football just because everybody plays football, so that’s why I played. Basketball was my main sport. But by my junior, senior year in high school, I figured football was my best shot to play Division-1 in college. I played point guard. That’s what everyone in our family played. I was a pass-first guard. I knew that unless I became more selfish and took more shots I wasn’t going to get recruited, but scoring just wasn’t my game. If I get into the lane and somebody comes up on me, I’m dishing it off. My father used to get on me, like, “Man, you gotta shoot!” I had games where I led the team in scoring a few times, but that just wasn’t my style. Football was different. I played running back up until my senior year (in high school), so I was getting the ball. It was easier for me to shine in football. I was a downhill power back, like one of those old Nebraska or Ohio State running backs. My senior year I moved to linebacker and led the state in tackles. My father used to show me clips of Muhammad Ali. From the first time I saw them, I fell in love with boxing. When I got to college it was still something I wanted to do, and it turned out Kentucky had a boxing team. So after football practice I’d go to the boxing gym. At the time, I wasn’t playing a lot (in football). From an athletic standpoint, I’ve always felt like I was the best at what I was doing, but the coaches didn’t always see eye to eye with me. I figured, if somebody is gonna beat me out at something, they have to prove it to me. I want to know what they can do and what they can’t do. That’s one thing I love about boxing; the competitive nature, being better than the other person. Did you have any internal conflict about practicing a religion of peace while competing in violent sports like boxing and football? You get some people who wonder why, as a Muslim, you would box. I mean, it doesn’t seem like something any ordinary person would do. You’re literally hitting another person in the face for the sake of competition. You’re giving vicious body blows. It can bring a dilemma. What are your intentions? Are you really trying to hurt your opponent? It’s something to think about. My views are different when it comes to that. Boxing is a great way to stay in shape; to me it’s the best way I’ve found so far. And I think it’s good for everyone to pick up a skill or two. Whether it’s boxing or martial arts or some other form of self-defense, everybody should know something. So from that standpoint, I think it’s OK.
As your college days wound down, what were you planning for your athletic future? Were you aiming to be a pro boxer or a pro football player? Going pro in boxing. That was my mindset. I had some opportunities to do it — I could go pro tomorrow if I wanted to go pro. But that was my plan. Like, if you’d told me in my senior year of college that 10 years from then I wouldn’t be a boxer, I’d be shocked. 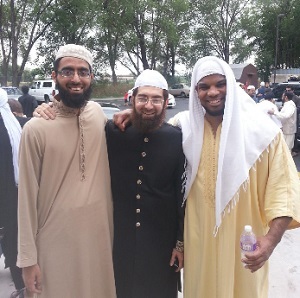 Ahmad (right) with Imam Muhammed Shoayb (middle). What do you do today to stay in shape? I jog in the morning. That’s the best time to jog, because it gets your metabolism up. Then I’ll get in another workout after work, either cardio or lifting. You did a lot at Weber State. What did holding all of those jobs add to your skill set professionally? It was phenomenal. It served me tremendously. I was fortunate to work with a legendary head coach, Ron McBride, who took me under his wing. He had me work with the O-line one year, then the next year I’d be with the running backs, then the defensive line. From a football standpoint, I got comfortable with the offensive side and the defensive side, so if I were to go on and be a head coach, I’d be very comfortable. When I got moved to director of football operations, that taught me what I needed to know from the administrative standpoint: fundraising, tickets, advertising, stuff like that. Recruiting was what I was known for — I brought in some good players at Weber State — but I was able to see every aspect of the college game from that experience. It prepared me for any type of job. And Coach McBride was real big on critique. If you weren’t doing something right, he’d let you know. He wasn’t shy about putting you on the spot. It helped me a lot. The job I have now, it’s kind of scaled back compared to that intense environment. I mean, in college football, if you lose, you get fired. You have to be on your ‘A’ game every single day. Is that why you stepped away from the college game? The intense pressure? It wasn’t really that. There’s a beautiful Muslim community in Salt Lake, and there was an imam there, a scholar who I became close with named Muhammed Shoayb. I wanted to study under him and learn the Quran. When the opportunity came up, I knew I wouldn’t have another one like it. It was an opportunity I didn’t want to pass up. And with Coach McBride retiring, reality hit. It’s not that easy to get another job coaching, and if you stay in it you’re going to be moving a lot. That’s just the nature of college coaching. So I left Weber State in December 2011, and in January of 2012, I started studying with the imam. I thought (working at the high school) would be something temporary, but I loved it so much. I never pictured in a million years that I’d like coaching high school football. When you’re coaching at the college level, it’s like you have this arrogance about you that high school is beneath you. But once I got here, I didn’t want to leave. Talk about your religious background. I was raised Muslim. My parents converted in the early ’70s. During that time, a lot of African-Americans were converting to Islam. My father was in the Nation of Islam. When W.D. Mohammed brought a lot of people in the Nation over to traditional Islam, that’s when my father came over. We didn’t have a big Muslim community in Oklahoma. My most eye-opening experience living in a Muslim community came when I was (at Kentucky). That’s why Lexington is like a second home to me. I love the city because of the community there. When did you kind of come into your own as a practicing Muslim and know for sure this was your chosen path, not just what your parents wanted you to do? When I was 12 years old, I got to know Imam Suhaib Webb. He and my older brother were close. He was a big influence on me; a very positive teacher and role model who had a lasting effect on me. That encounter with Suhaib changed everything for our family in a positive way, and that positive change contitues to this day. You obviously love Islam enough to walk away from a potentially lucrative career in favor of strengthing your connection to Allah and the Quran. What about Islam appeals to you the most? The simplicity of it. You can look at any aspect of Islam — at the five pillars, at something as simple as why it’s important to say “Asalaam alaikum” — and if you get a deep understanding it will make a positive change in your life. It’s the simple things, man. Beautiful things. Like, I love tafsir. I love the Quran. I love when the imam goes over different surahs. I love hearing the meaning and how it applies to every aspect of someone’s life. Any question you have, Islam has an answer. What was that experience like, studying under Imam Shoayb and getting a better understanding of the Quran? Best experience of my life. There’s nothing like it. If I were younger, it’s something I’d want to do full-time. It gave me a solid base, just the foundation I needed. And I was able to bring that foundation to my family. Knowledge is special, and that experience gave me an opportunity to increase my knowledge. Were you able to memorize the Quran? Oh no (laughs), I’m not anywhere near where I need to be. I’m not a scholar, not anywhere close, but I’m appreciative of the time I’ve had to learn under one. It’s an unbelievable experience. Me being from Oklahoma, we had to start me with the basics. This heavy Oklahoma accent, that had to go out of the window just to be able to pronounce (Arabic) letters correctly. There would be kids studying at the same time as me. You’ve got these kids, eight and nine years old studying, and then you’ve got me, this former college football player, sitting right next to them. Between Oklahoma, Kentucky and Utah, you’ve lived in some places where people wouldn’t think there are big Muslim communities. Some people might even think there are no Muslims there. What has your experience been like in these places? If I was an outsider, I wouldn’t think there were any Muslims there, either. (Laughs) Where I grew up in Oklahoma there aren’t a lot of Muslims, but there’s a big community in Oklahoma City. Lexington, I didn’t think there’d be anything there as far as a Muslim community, but I found out there was. In Utah there are about 35,000 Muslims. Again, no one would have guessed that. I was at jummah in Salt Lake City and they said there were close to 40 different countries represented. You wrote a Twitter post recently talking about your admiration for Muslim scholars who have been speaking out against what’s happening in Gaza. You said they are real heroes. Meanwhile, we all know a lot of people look up to athletes as heroes. What’s your view on the meaning of heroism? Can athletes fit into that definition? I don’t think there’s anything wrong at all with having an athlete as a hero or a role model. Muhammad Ali is a role model. Kareem Abdul-Jabbar, he’s a role model. Michael Jordan, he’s a role model for how he carried himself like a professional and competed in a healthy way. I think athletes can be heroes. So can teachers. So can regular community members. To me, a hero is someone who’s doing the right thing, even when it’s not easy to do the right thing. For some people it might be something they say, or don’t say; for some people it’s something they do, or don’t do. In the old days, athletes like Muhammad Ali and Jim Brown, they spoke about that kind of stuff. Today’s athletes are too scared. Like, I think it was Dwight Howard who posted “Free Palestine” on Twitter and immediately deleted it. We have a war going on in Palestine. It’s not easy to speak about that. Even for scholars, it’s not easy. Certin groups will hammer you down if you take a certain position. They’ll call you every name in the book. So someone who’s doing something — taking a stand — you have to respect them. When something needs to be done, you do it. Innocent people are dying and we can’t continue to stay silent and stay inactive. For some people it might be writing letters to Congres; for some it might be making a speech or assisting with food drives. Whatever you do, you can’t be inactive.